Be the first to share your favorite memory, photo or story of Deliah. This memorial page is dedicated for family, friends and future generations to celebrate the life of their loved one. her daughter and son in law at her side at The Hospice of the Valley in Phoenix, Arizona. She was born on April 16, 1934 in Whitley County, Ky. She was the daughter of Inez Bunch Gann and beloved stepfather Calvin Crago. 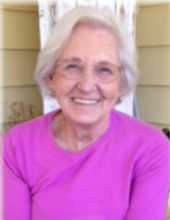 She was a loving mother who enjoyed cooking, baking and spending time with her family and friends. Her children, grandchildren and great grandchildren were the pride of her life. on the University of Kentucky basketball team each season. She is survived by two sons, Michael Wyatt and wife Sharon Wyatt of Fleming Island, Florida and Kent Wyatt and wife Debbie Wyatt of Independence, Kentucky. As well as one daughter, Carla Schwarte and husband Mark Schwarte of Villa Hills, Kentucky. 6 Grandchildren: Michael P Wyatt, Lori Fox, Elizabeth Boyd, Justin Wyatt, Samantha Hatfield and Gracie Wyatt. She also had 7 great grandchildren: Michael V Wyatt, Sarah Fox, Emma Fox, Trevor Wyatt, Reighanna Wyatt, Emily Hatfield and Brett Boyd. Visitation will be from 1pm until 3pm on Saturday, March 23rd, 2019 at the Croley Funeral Home Chapel in Williamsburg with the funeral services at 3 pm following. The Rev. Lloyd Taylor will be officiating the sermon. She will be laid to rest in the Highland Cemetery in Northern Kentucky on Monday, March 25, 2019. To send flowers or a remembrance gift to the family of Deliah Jean Wyatt, please visit our Tribute Store. "Email Address" would like to share the life celebration of Deliah Jean Wyatt. Click on the "link" to go to share a favorite memory or leave a condolence message for the family.